You want your business to be successful. To do that, your business needs exposure. If you have a commercial vehicle — or a fleet of them — having the right graphics emblazoned on them is one of the best ways to get the attention of your potential customers. Consider this: while on the road, it’s not unrealistic for around 10,000 people per day to see your car, truck, SUV, bus, van, trailer, or all of the above. Remember that each vehicle is representative of your company, so it’s imperative that each vinyl wrap on your fleet vehicles is done perfectly. If you’re looking to embellish your company vehicles with eye-catching images, partner with Evolve Graphic Solutions. Our team brings you more than five years of experience in flawlessly installing small and large logos, and partial and full vinyl vehicle wraps. By using superior vinyl wrapping, we can ensure the wrap will withstand any harsh weather Mother Nature throws at it — something crucial in and around Fort Collins. As a certified 3M Preferred graphics installer, we complete every vinyl wrap we do with acute attention to detail, flawless precision, and using 3M knifeless tape, which means you’ll see no knife marks whatsoever. Plus, if we need to disassemble handles and auto body panels in order to properly tuck edges, we’ll do so. This commitment to providing our clients with results that meet or exceed their expectations is why we’ve gained a reputation as the best vinyl wrap installer in Fort Collins. 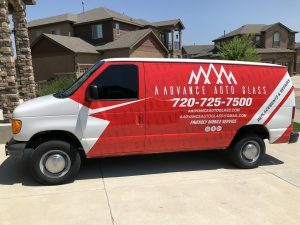 Quality matters to the success of your business, and a subpar vehicle wrap just sends the signal that you’re comfortable cutting corners — not the impression you want your customer to get. That’s not acceptable to us, so we’ll always take the time to do it right and help your brand shine. For a free same day quote, contact us online or by phone today.